What does the "classroom of the future" look like? In contrast to the traditional lecture-oriented room, this increasingly popular kind of space, known as a "studio classroom," emphasizes group learning and collaboration. But designers might not always get it right. AV expert Michael Leiboff shares 14 distinct characteristics of a successful studio classroom design. A new type of classroom design, often called the classroom of the future, is becoming popular in K-12 and college environments. It's based on the desire to move away from the traditional lecture-based pedagogy toward what is referred to as "studio teaching." In this model, the instructor serves as a facilitator, by handing out projects, answering questions, providing resources, and moving around the room as necessary. Students work in groups to learn, and activities are structured to emphasize collaborative, active, student-based learning. The most startling characteristic of these classrooms is that they don't have a recognizable "front," either visually or from the perspective of the place where you expect the teacher to be. And this has several implications for design and technology integration. Here is what you need to know about studio classrooms. 1. They have multiple electronic display surfaces oriented on different walls. Some are large projected images, using dedicated ceiling mounted projectors. The images projected onto these screens are used to engage larger groups of students or the entire class. Other displays are wall-mounted flat panels, 42 inches or larger, the orientation of which might be shifted from side to side. Groups of students would utilize these screens to display computer-based materials within smaller workgroups. 2. A good portion of the perimeter walls are made up of writing surfaces. They might even be magnetic to enable them to be used as tack up surfaces. Traditional cork board tack surfaces are also available for the display of paper-based materials created during class sessions. 3. In some cases, the furniture is lightweight, movable, and reconfigurable to accommodate workgroups of various sizes. Chairs are comfortable and on wheels. The room is sized to allow for comfortable circulation and a certain messiness, even chaos, during classroom project activities. In this case, the floor is covered with a sturdy carpet material, and designed with a grid of power and data outlets. In other cases, small clusters of fixed tables are arranged to accommodate face-to face interaction of student project teams. Connectivity and power are integrated within the table surface. 4. At times, there is a formal instructor's workstation. Alternatively, it might be mobile and small. In either case, most of the time the instructor is a wanderer, listening in on discussions, answering questions, and furnishing resource materials. 5. Remote control of the room's audiovisual technology often is controlled from a wall-mounted control panel. Using it, a teacher or student can access network-stored multimedia, control display devices, etc. 6. Though the entire building might have wireless network connectivity, an array of hardwired outlets is furnished to provide connectivity to support ultra-high-bandwidth multimedia applications. Wall outlets provide power for recharging purposes as well as to support various portable equipment. 7. The lighting is zoned such that the fixtures closest to the projection screens could be turned off independently of the other fixtures. Indirect lighting provides a comfortably soft illumination and is daylight-balanced. Room sensors might automatically extinguish lighting when the room is not occupied. 8. The HVAC is quiet and possibly even independently controlled from each room. The acoustics of the classroom ensure that the space would not be too hard or reverberant and that the space would be well isolated to ensure that "exciting" or overly enthusiastic learning activities in one room did not disturb adjacent classes. 10. There may be fixed work surfaces along a portion of the periphery of the room. On them, students assemble projects and use the document camera, printer, or computers dedicated to the room. 11. The room would have a dedicated computer and DVD player and would be able to receive cable or satellite, as well as Internet based video programming. And the display system should have connectivity for personal video devices, such as iPods or notebook computers. 12. Ceiling or flat panel speakers would be used to provide the sound from any recorded or live program material. 13. 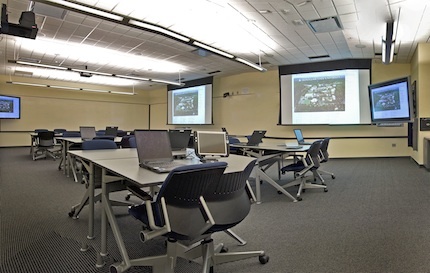 Dedicated video origination capabilities, consisting of cameras located at the front and rear of the room would be used to capture classroom activities. These activities could be recorded, digitally, for later viewing, distributed anywhere in the building, or used for distance learning activities. Also video teleconferencing would allow collaboration with field teams and other remotely located groups. Guest lecturers would also participate this way as well. 14. Commonly, these rooms are designed with an enclosed equipment niche that provides access to the technology when necessary and hidden from view when appropriate. The degree to which permanent storage is provided within the room depends on the particular requirements of classes being held there. In order to meet budget constraints when designing these types of spaces, consideration should also be given to delaying initial equipment purchases but ensuring that the base building infrastructure, power, conduit, sight lines, and support structures in the ceilings and the walls are furnished. While it is tempting to hope that a single room configuration, using movable furniture, can serve both traditional lecture and studio classroom activities, the integration of technology together with a front/no front orientation, makes a significant impact on how the room will work. The best outcomes are achieved when classroom design and teaching/learning activities are well synchronized.